Mating in porcupines is a bizarre affair. It begins with a nose-rubbing gesture by the male to nudge the female. If step 1 impresses her, she will allow the male to (well, this isn't for the squeamish) urinate all over herself. This isn't a bout of kinkiness that the female experiences, as you might think, but is meant to enable her to judge whether the pheromones are acceptable or not. If the female approves of step 2, she presents her soft underbelly (which is devoid of quills) for the male to mount. 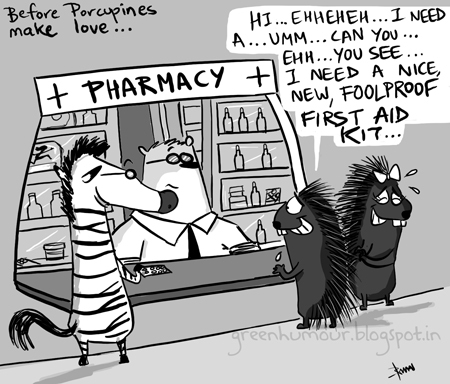 Porcupines are the third-largest rodents after capybaras and beavers.